Mack Trucks donated a 2019 Mack® Granite® model to the Concrete Industry Management (CIM) Auction, which will be Wednesday, Jan. 23 during World of Concrete 2019. All proceeds from the auction will benefit the CIM program’s mission to develop the next generation of leaders within the concrete industry. 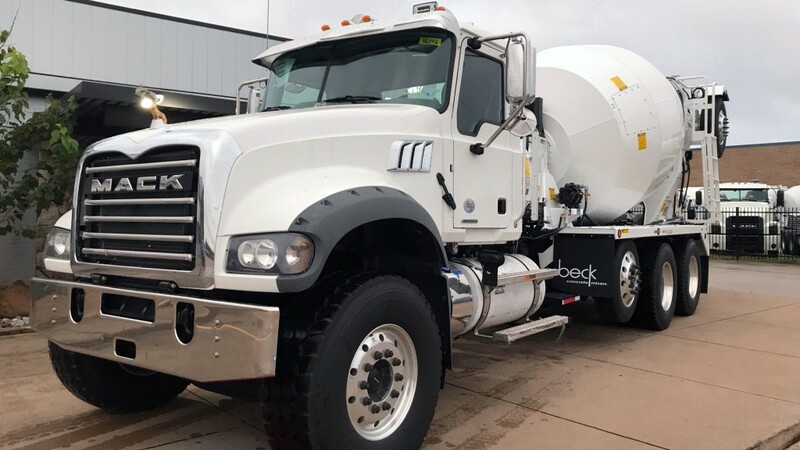 Mack Trucks is continuing its support of the Concrete Industry Management (CIM) program with the donation of a 2019 Mack Granite model to the CIM Auction. Proceeds from the auction, to take place Wednesday, Jan. 23 during World of Concrete 2019, will benefit the CIM program's mission to develop the next generation of leaders within the concrete industry. "As a leader in the construction market, Mack understands the hard work required to succeed in today's ultra-competitive world," said Tim Wrinkle, Mack construction product manager. "That's why Mack is proud to support the CIM program and their efforts to develop future leaders and teach them the necessary skills to be successful within the concrete industry." Spec'd as an axle forward, boost-a-load mixer, the donated Mack Granite model is powered by a 395-horsepower Mack MP7-395C engine, which also delivers 1,560 lb.-ft. of torque. The engine is mated to a 14-speed Mack mDRIVE HD with ultra-low ratio creeper gears, as well as Mack front and rear axles. The Granite model features an 11-cubic-yard Interstate Class VORTEX paving mixer, generously donated by Beck Industrial. "Mack Trucks has stepped up once again with a significant donation in support of CIM," said CIM Auction Committee Chairman Mike Philipps. "This truck will not only help ensure a successful auction, but will enable us to continue providing an outstanding education to future leaders within our industry." A four-year degree program, CIM focuses on developing the in-depth business, technical and communication skills required for success in today's concrete industry. Approximately 500 students are currently enrolled in the program, which is offered at four institutions: Middle Tennessee State University, the New Jersey Institute of Technology, California State University - Chico and Texas State University. In 2018, bidders helped CIM raise more than $1.1 million in gross revenue through its silent and live auctions, thanks to the generous contributions and support of the concrete industry. Mack Trucks has participated in the CIM Auction with a truck donation for several years.